I use a kind of therapy forwarded by the German Doctor Ruediger Dahlke. Just color a given pattern as you like. The result is usually stunning, it looks pretty whatever you do and the teacher or parent can praise you with full intention (not just pretending...). So children feel encouraged to do more. Older people feel the long-lost artist awakening. Everyone feels his power of concentration getting better and better, school results are improving, elderly people become more active. 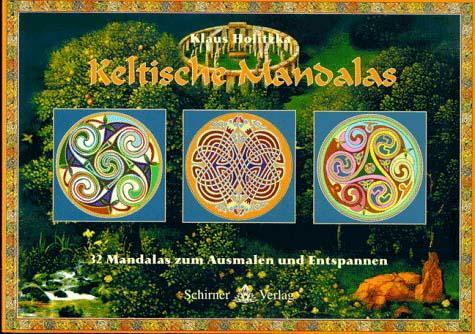 Books with Mandala patterns now range in the hundreds in Germany. From simple ones for kindergarden level through all kinds of school ages. From various cultures to various patterns in nature. From geometrical patterns to the most complicated ones used in Buddhist mandalas. See the links below. You can choose a pattern that you like and try your hand. Doing it before going to bed will bring you a solid sleep. All anger and anxiety is gone by the time your mandala is finished. It is a pretty cheap way to reach a transformation, so not very much appreciated by the medical profession (nobody can get rich, nobody studies it). To color the given patterns is more creative than you might think in the beginning. You really get in the creator mood, start seeing patterns and feel your own life is your own creation within the limits of the patterns of human beings. Thus a feeling of freedom arises you might not have experienced before. From this feeling, healing results in the long run. Here are some of Dahlke's books in English. Intrinsically beautiful, the intricate round patterns of mandalas are wonderful tools for self-reflection, meditation, and self-therapy. 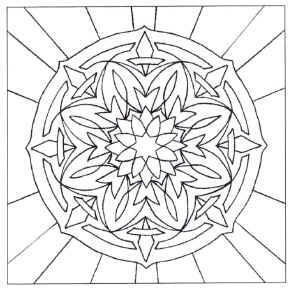 In this unique workbook, you will encounter basic principle mandalas that you can color and use in various rituals and exercises. Despite the associations of coloring with childhood, coloring mandalas has remarkable therapeutic effects--and it's fun too. Use mandalas to treat depression, midlife crises, and even physical complaints. Harmonize your flow of energy, improve your concentration and relaxation, and gain strength from your own center. By coloring, a person accepts the orderliness of the mandala, which seems to help the soul to create order as well and to place everything where it belongs. It teaches a degree of patience and helps make difficult issues seem simpler. Through mandala therapy you can intuitively regain perspective on what really matters in life, and focus on what is essential to you. A wonderful source book of mandala designs from around the world. Line drawings cover both Eastern and Western circular patterns of many kinds. 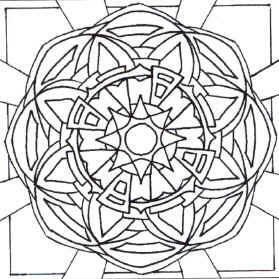 On this link you can find more books with Mandala patterns for coloring. 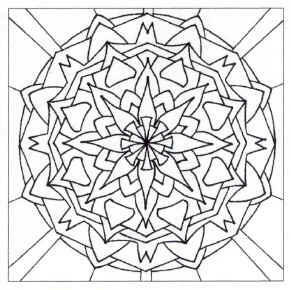 Here is a page (or rather eight) with online mandala patterns for you to print and fill in with colors. Here is the rest where you can copy your favorite. A German Link with many buttons to click. There are other forms of Mandala Therapy. The word "mandala" comes from Sanskrit meaning squared circle, circle and the center. Most of the known mandalas are from Tibet and India, but the idea and the use of mandalas can be found in every culture: Stonehenge in England, the old calendar stone of the Aztecs in Mexico, the bronze marriage mirror of the Tang dynasty in China. In the northern Finland shamans have drawn mandala-type drawings and symbols on their drums. North American Indians have used mandalas as an important part in their healing traditions as well as Australian Aborigines in their ground-paintings. Whirling dervishes (the Near East) have created mandalas by dancing. An astrological chart is a mandala, and so are I Ching charts in China. In a mandala there is a center, cardinal points and a symmetry, and sometimes a circle. In a cathedral or you'll see a mandala in stained-glass windows, in the architecture etc. It can be found in "normal" art and psychedelic art, in wall paintings, in the designs of bowls, in ceremonial cloths and in byzantic textiles. The Peace that passes understanding is the quiet mind, the mind in which all inner dialogue is suspended. Mandala therapy is one way in which your mind can rest, going inward toward the center of your loving Heart. Your Heart is the source of your power and your wisdom. Your intuition arises from your Heart. When your mind is quiet you can hear your intuition which is your most powerful source of guidance. A mandala is a circular image which is created as a healing or spiritual symbol for meditation or reflection. It has become popular as a form of art therapy because the ritual aspect of its creation seems to induce a sense of calm so it appears a safe way of journeying within - the circle gives boundaries to the work of art. "Mandala is about working out your problems." It's a way of expressing and solving problems through colour and line. It's not an art and the whole point is to understand your own language, which is not very difficult. You have to create your own Mandala and not look at some one else's. In a Mandala, the picture and the colours matter altogether. It's not about personalities; it's about working out your (own) problems. With its help you can tell stress levels, suppressed anger and what you should do about it. Carl Jung and the Mandala. Early Tibetan Mandalas: The Rossi Collection. Mandala 101, by Betty Jiron. What a wonderful blog you have! I too use mandala therapy, I call it "mandala medicine", but instead of coloring them, I make my own..just creating inside the circle - it is magnificient creative therapy. The original version, brought to Japan from China by *Kuukai 空海 (774-835), was kept at Touji 東寺 (Kyoto), but because it began to show signs of wear in Kuukai's later years, a copy was made in 821 (Kounin 弘仁 12), this first copy is known as the Kounin version.